Samsung invites you to make every game a big game with the super big, 4K Samsung QLED TV, in a new commercial. 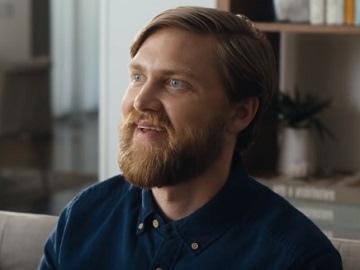 The 30-second spot opens with the face of a man watching a football game. “This is the face of a man watching college football on an 82-inch Samsung QLED TV. He’s not watching his team. He doesn’t even have a team. He’s more of a golf guy. And yet, here we are,” the voiceover says, while the respective man is watching TV captivated. The commercial ends with the voiceover adding the tagline “Captivating color. Gripping 4K”. The Samsung QLED TV, the official TV of ESPN College Football, features Q Color with 4K image upscaling, which delivers stunning picture quality and captivating color, more than a billion colors, motion rate 240, anti-glare technology, and Universal Guide, which brings every game together in one easy-to-browse menu and even notifies you when your favorite teams are playing. Consumers now have the chance to score early access to Black Friday prices by getting up to $1,500 off select QLED TV models and up to 25% off The Frame TV. Prices start from $1,299.99.